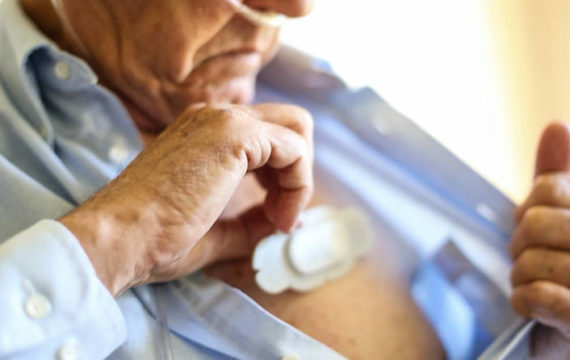 The adoption of a new generation of disposable, connected sensors will be driven by the ongoing development of remote patient monitoring applications, ABI Research writes in its latest healthcare report. Combined with use in hospitals and clinics, shipments of single-use sensors capable of transmitting patient data wirelessly, will exceed 3.5 million sensors annually by 2022, growing at a CAGR of 30% from 2016 shipments. In maart/april zal de Europese Commissie nieuwe stappen en plannen aankondigen op het gebied van e-health. (beeld: Philips). Already the worldwide healthcare wearables market accounts for US$6.8 billion of the current US$25 billion wearables market. ABI forecasted late August that wearable healthcare, including healthcare devices, sports, fitness, and wellness trackers will continue to dominate the wearables market and will exceed revenues of US$10 billion in 2022. Disposable sensors will become an important segment within wearable healthcare. Disposable sensors, without embedded wireless transmitters are already commonplace in remote patient continuous glucose monitoring applications from Dexcom, Medtronic and others, but their potential reaches far beyond. Disposable connected sensors can support applications including medication tracking, temperature, heart rate and pulse oximetry as well as activity/movement/post-surgery orthopedics monitoring that address a far larger user-base. A host of companies is investing in developing disposable sensors, but are taking varied approaches regarding sensor format and supporting technologies. These companies range from established players including Philips Healthcare and Medtronic to well-backed ventures like Qualcomm Life and smaller start-ups like GenTag and Proteus Digital Health. In addition, a range of wireless protocols are under consideration for adoption in disposable smart health sensors including Bluetooth, NFC and Proprietary offerings. “What these and many other companies share is an understanding that healthcare workflows and reimbursement payments are already steeped in the broad use of disposable devices. Between now and 2022 will be a key time for these vendors and others to address technical and ecosystem complexity around disposable sensor connectivity. It will also be the primary time for vendors to gain a foothold in the emerging market,” says Collins. Healthcare wearables that monitor health conditions, physical performance, and brain activity will move beyond smartwatches and fitness trackers; they will shrink in size and change in form factor type. Unlike today’s bulky health related devices, ultra-thin and ultra-soft sensors with software analytics make next-generation wearables smarter and more useful, ABI believes. Replacing costly doctor visits and painful lab-based blood tests, non-invasive sweat sensors can measure a set of key biometrics from a single bead of sweat. A few companies are working to capture the sweat sensor market, such as Eccrine System, GraphWear Technologies and Kenzen. These sensors require flexible components and startup Royole is leading the way. Royole’s plan for mass production of flexible displays and sensors will accelerate the technology adoption for wearables and facilitate more aesthetically-pleasing wearable designs, smaller form factors, and more immersive experiences.